Yay! Back to school supplies, thank you!!! Love to get my hands on that!! I looove pens! I’m a pen freak! My husband and I love Bic pens. Thanks!! I love pens! esp. Free ones! Would love to try pens! 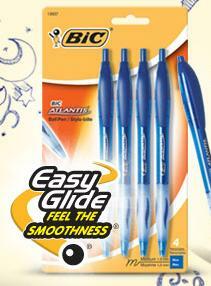 Thank You in advance if I qualify for an Atlantis Pen by BIC!!!!!!! I would say in advance that I appreciate your kindness in regard to this beautiful pen!!!! !